Last month we highlighted an infographic, detailing the future of RFID. We've also showed you some differences between QR codes and SnapTags. Now we've run across a couple more automatic identification infographics that might give you a little better insight into how these different technologies work. Since RFID tags and readers are becoming more and more mainstream for transportation applications - think monitoring parking structures and toll booths - we thought you might want to know a little more about how these processes work. 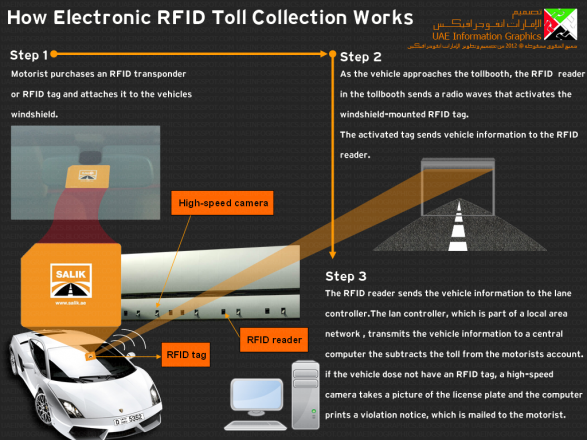 The following infographic shows how the toll collection process works using radio frequency identification. by uaeinfographics.Learn about infographics software. And here's another infographic that shows how bar code scanners work. There's an interesting section about halfway down the page that shows how bar codes represent the numbers 0 through 9. Infographics seem like a great conduit for technical companies to provide more insight into complicated technologies. What other types of helpful autoID resources have you run across? Leave a comment below.